Iron Age celts story writing | Hail Spartapuss! Mogzilla Books for Children and Adults of all ages! I had a lot of fun researching the Celts whilst writing the third and fourth books in the Spartapuss series: Die Clawdius and Boudicat. 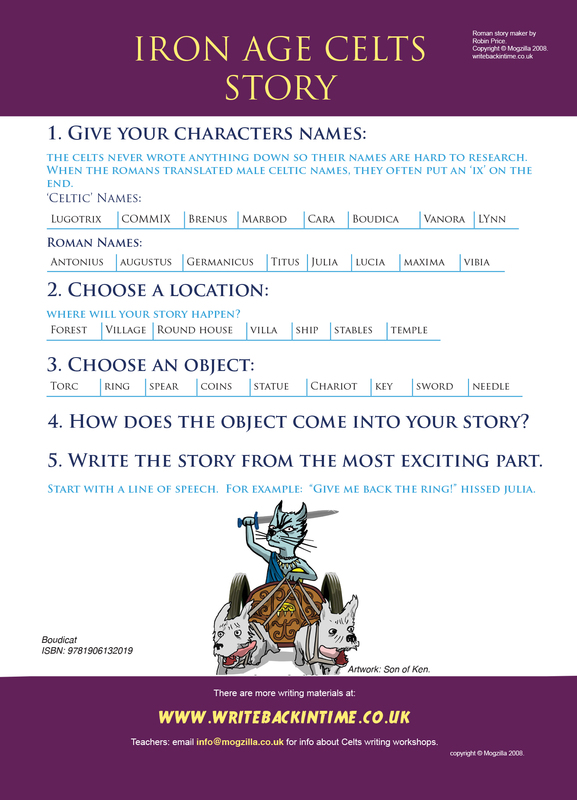 Your class can write their own stories about the Celts (and Boudica) using this ‘flash writing’ story-maker. Email robin@mogzilla.co.uk or call 0844 884 1742 for more info on my assemblies and creative writing workshops. • ‘Planners’ who love to map out their whole story in detail. • ‘Jumpers’ who hate extended planning and feel the need to get going ASAP. • Techniques like the ‘story mountain’ are ideal for ‘planners’ but they leave other children struggling to focus. It’s not just children who have different ‘creative personalities’. Some actors (like Dustin Hoffman) love to build up a detailed character from scratch, step by step. Other actors take a flying leap at the character and ‘find’ it in a flash of creativity. Many writers love planning and mapping out complex worlds. J.K. Rowling famously planned out all 7 Harry Potter books before writing book 1. However, other writers like Wolf Hall author Hilary Mantel describe ‘channeling’ their characters spontaneously. Mantel does not write her books in order, (often writing the middle Chapters before the beginning). There is no single ‘correct’ approach. Every writer needs to find a way that works for them. Many children are ‘jumpers’ who zone out during the planning. To get everyone off to a good start, I have developed ‘flash’ stories. Armed with a simple framework (like the one above), you can move swiftly through the planning and get their ideas flowing onto paper. I often do one example first on the board as a ‘demo’ getting them to vote on options. 1. Put the class into pairs. Give them the writing frame to each pair. Get them to pick one option each. 2. Tell them to write from the most exciting part of the story. After 5-10 minutes of planning you’ll get everyone writing (in pairs). Within an hour the class should be ready to share out their stories. If you like this approach, there are a lot of ways you can develop it and use it in class. You can introduce or practice new vocab or structures, practice dialogue or even use two flash stories (a few weeks apart) to assess their progress. Flash stories are also ideal for assisted learning (where the adult takes the part of one pair). For my free .pdf ‘7 Tips for teaching story writing’ please email robin@mogzilla.co.uk with ‘Tips’ in the subject line or call 0844 884 1742 to discuss a workshop. Dr Elizabeth Dollimore, Shakespeare’s Birthplace Trust, Stratford-Upon-Avon. For those about to write, we salute you! Original Spartapuss art by Son of Ken. Olympuss Games artwork and map by Chris Watson. Dogren and Gatita by Ed Tarantino.